Paraphrasing the question posed in Joseph Heller's Catch 22 - "What if everyone was blogging about the Connecticut Democratic primary?" I can only respond as did Yossarian: "Then I'd be a damn fool not to." Ned Lamont beat incumbent three term Senator Joseph Lieberman in the Democratic primary by a margin of 4% with an unprecedented high voter turnout for a primary. Lieberman was not facing any scandal. Lieberman's tenure and committe appointments put him in a position to shovel pork to Connecticut with a bulldozer. He had a huge campaign war chest, and the solid support of the Democratic Party establishment. He was endorsed by the Democratic party demi-god Bill Clinton. This is the profile of an incumbent that cannot lose. Some attach significance to the fact that the margin of victory closed to only 4 percentage points, but this is clearly a case where "The wonder of a dancing bear is not that the bear dances well, but that it dances at all. "* Well, this particular bear was looking like Gene Kelly last night. Defeating an incumbent is a very hard thing to do in a general election. Defeating an incumbent in a primary is well nigh impossible. We saw an awful lot of "dancing bears" last night. An incumbent moderate Democratic Senator that was a hawk on on the war was defeated. An incumbent, anti-war rabid left wing Democratic Representative of Congress was defeated (opeative word is "rabid"). An incumbent moderate Republican Representative supported by Presdent Bush was defeated. If a dancing bear is a wonder, a pas de trois of dancing bears is even more notable. "In the shadow of the Democratic Senate primary in Connecticut, angry voters in three states showed their discontent last night by unseating two incumbents and choosing a candidate who campaigned against his primary opponent's bipartisan past. The defeat of Georgia's outspoken Rep. Cynthia McKinney (D) and Michigan moderate Rep. John J.H. "Joe" Schwarz (R) appeared to confirm the strong headwinds that polls suggest members of Congress will face in November from an angry electorate looking for change." The Glittering Eyes asks: The people have spoken! But what the heck did they say? "My first reaction to last night’s results with Lieberman, McKinney, and Schwarz all defeated was that there was an anti-incumbency movement at work. But on reconsideration I’ve decided that, as James Joyner notes, the results are more clearly explained by issues specific to each individual campaign than some general movement against incumbents." James Joyner at Outside the Beltway wonders if: Lieberman + McKinney + Schwarz Defeats = Anti-Incumbent? "Uh, against how many incumbents who won their primaries? Don’t they signal anything? Oddly, since I tend to vote Republican, I have paid no attention to the Schwarz contest. I gather that he was, like Lieberman, defeated by a candidate more closely aligned with his party’s base. McKinney is, well, McKinney. Slapping a police officer, making one outrageous statement after another, and an even nuttier dad making constant idiotic statements to the media were, shall we say, not helpful. Now, I don’t doubt that there’s a strong anti-incumbent wind out there. But three losses easily explained by the idiosyncracies of the individual contests are hardly further evidence for it." Nonsense. No one goes into a voting booth and just votes against incumbents. A general anti-incumbent bias is always distilled to the "idiosyncracies of the individual contests". 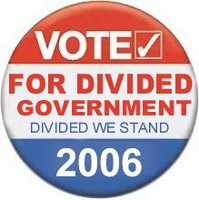 The "idiosyncracy" is a specific action trigger for the generalized anger at incumbents over the direction this government has taken our country. In this environment, voters look for idiosyncracies as an excuse to throw their particular bum out of office. They are practically begging for an idiosyncracy. "Just show me an idiosyncracy. Make my day, punk!" One incumbent losing a primary is an interesting aberration. Three losing a primary is a political chorus line of dancing bears. And that dancing bear chorus line will look like the Rockettes by November. The DWSUWF blog will happily join that high-stepping, incumbent-kicking line. You asked about securing your blog. Here are the threats that I know of. # Weak passwords, that are susceptible to password cracking, generally brute force activity. Strengthen your password! # Password logging malware. This is a very common problem in computers; it's possible that there is malware out there that is targeting Bloggers. * Become aware of what malware is out there. * Check your computer, carefully, for malware. If you find anything interesting, report it, here. Let other Bloggers know what to look for! * Protect yourself. Layered security is a good start. # Blogging on computers, or networks, that we can't (shouldn't) trust. Any time you enter your Blogger account, or password, using a public computer, location, and / or network, you are at risk. Think. * Using a public computer, maybe one in a library or at work, that someone can later access. * Using your own computer, but on a public network, maybe in a coffeeshop or at work.